A community has existed in Carradale for many centuries and by the 17th and 18th centuries crofting and fishing were the main activities in and around the village. 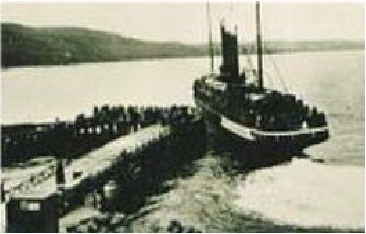 The introduction of steamships transformed Kintyre and from the 1830s daily steamers plying between Campbeltown and Glasgow would call in at Carradale. 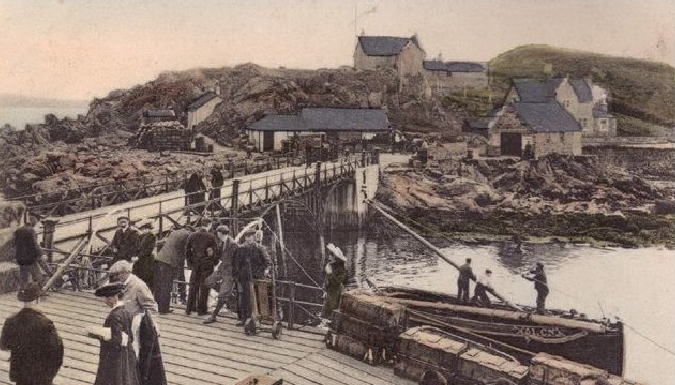 With the herring industry thriving, Carradale’s first pier was built in 1858, developing and encouraging the holiday trade, with several hotels becoming established in the village and many families returning to the area year after year. In 1870 this was replaced by a new pier, the first iron pier to be built in Scotland, with 2 levels, a higher one for the steamers and a lower one for fishing boats, connected by a sloping ramp. 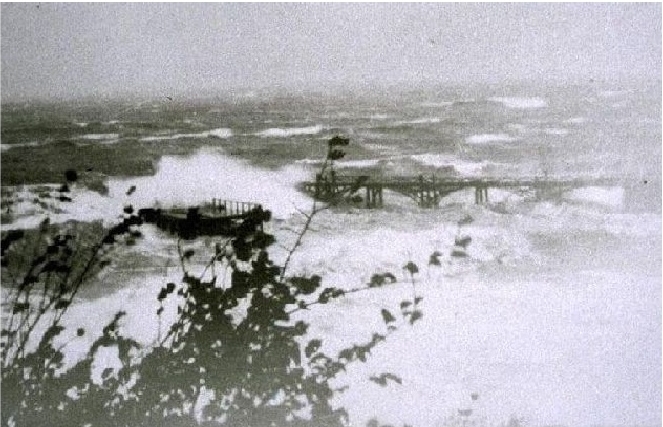 One of the pier master’s jobs was to issue gale warnings to passing ships. A cone-shaped bag was hoisted on a tall mast (seen in the photograph above) on the hill beside the ‘Pier House’ and its foundations and tabernacle fitting may still be seen. The cone would point upwards for northerly gales, downwards for southerlies. There was also a mercury-filled barometer in the pier’s waiting-room which had to be reset daily to warn of any impending storms. The 1926-built steamer ‘Dalriada’, then probably the fastest single-screw steamer in the World, plied her trade in the Clyde and would call at both Carradale and Pirnmill on the Isle of Arran. 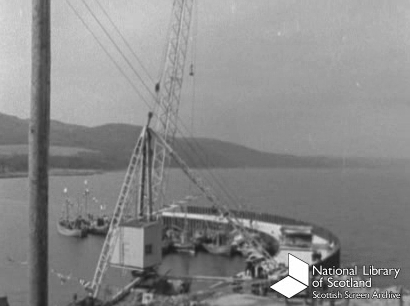 Here she is about to leave Carradale pier and below, en route to Pirnmill in 1938. 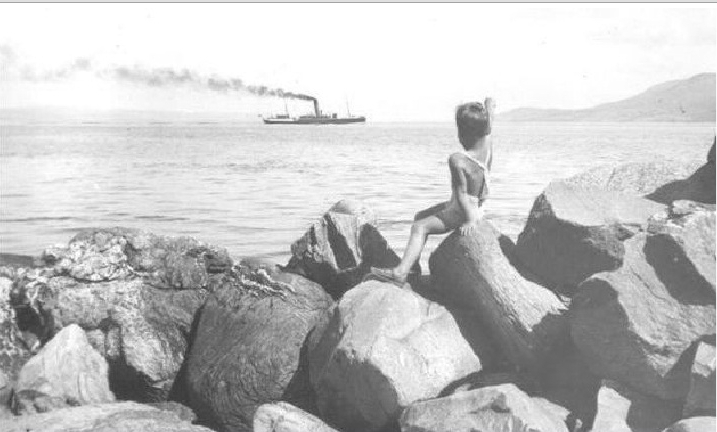 This picture below of the steamer pier, taken in 1949 goes some way to explaining why, around 1960 the harbour pier was replaced by a harbour wall. A short piece of film of the formal opening in 1961 is held at the Scottish Film Archive and this is a still from there. Click the picture to view the whole film. This clip, filmed in 2007, shows some of the fishing boat fleet returning to the harbour. Today there is only a small fishing fleet which regularly uses the harbour, catching largely prawns (langoustine) and shellfish, although the harbour now provides shelter to vessels servicing the salmon farm which lies a short distance to the north of the village.